US-China trade deal remains top-of-mind, yet, as uncertainly looms on progress from here, President Trump stated that the tariffs could remain for quite some time. Separately, pressure is mounting from international countries against Chinese human right violations against the communities in the Uighur region. Wednesday was a mixed day for the major Asian stock markets: Shanghai decreased 0.33 points (-0.01%) to 3,090.64; KOSPI decreased 0.52 points (-0.02%) to 2,177.10; Hang Seng decreased 145.31 points (-0.49%) to 29,320.97, and ASX 200 decreased 19.50 points (-0.32%) to 6,165.30. 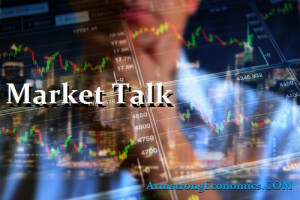 However, NIKKEI 225 and SENSEX took the opposite route, increasing 42.07 points (0.20%) to 21,608.92 and 23.28 points (+0.06%) to 38,386.75 respectfully. The major Asian currency markets had a mixed day today: The AUDUSD increased 0.0039 or 0.55% to 0.7126 and the NZDUSD increased 0.0036 or 0.53% to 0.6889. However, the USDJPY and the USDCNY took the opposite route after decreasing 0.6560 or 0.59% to 110.7140 and 0.0314 or 0.47% to 6.6847 respectfully. Both gold and silver markets had a green day today: gold increased 7.60 USD/t oz. or 0.58% to 1,313.98 and silver increased 0.13 USD/t. oz or 0.87% to 15.51. Brexit was at the top of the agenda yet again. Theresa May formally requested an extension in a letter to EU Council President Donald Tusk, moving the current March 29 date to June 30. Donald Tusk responded that an extension would be possible if UK MP’s would approve the current proposed withdraw agreement next week. Theresa May, when addressing the parliament, was steadfast “as PM”, she wants an exit at the end of June. And so it goes. Elsewhere, recent reports suggest that Italy will support the Chinese silk road and belt at the surprise of the EU and U.S. Chinese President Xi Jinping will arrive in Rome tomorrow. China is planning to create a global infrastructure which will heavily invest in roads, railways, and ports across the world. Some say this is China’s plan to become the global super power. A mixed day for major European currency markets: The GBPUSD decreased 0.0062 or 0.47% to 1.3205 and the USDCHF decreased 0.0078 or 0.78% to 0.9912. However, the EURUSD took the opposite route after increasing 0.0083 or 0.73% to 1.1432. As expected, the Federal Reserve have no plans at this time to raise interest rates, but this offered no boost for the markets. The Dow lost over 141 points (-0.55%, 25745.67 close), the S&P 500 fell by -0.29% (2824.23 close), the Nasdaq remained relatively unchanged (+0.07%, 7728.97 close), and the Russell 2000 dropped -0.76% (1543.16 close). After two days of deliberation, the Federal Reserve announced that they plan to maintain current interest rates for the remainder of the year – a stark contrast to December, when they had planned at least two rate hike rates in 2019. Based on current economic conditions, they will hold the current rate range of 2.25-2.5% until 2020 when the rate will rise to 2.6%, but we’ll see how firm this position is over time. The Federal Reserve has been working toward reducing the overall balance sheet since October 2017. The central bank’s asset portfolio peaked at $4.5 trillion, currently stands at $3.9 trillion, and will be reduced to around $3.7 trillion. To reduce the overall balance sheet, the Fed has allowed matured bonds to roll over instead of reinvesting the funds. On a monthly basis, around $50 billion in assets roll off the balance sheet. Starting in May 2019, the Reserve will reduce the monthly roll over rate range to $20-30 billion and cease cuts entirely in September 2019. Beginning in October 2019, the Federal Reserve will begin to reinvest bonds once again at an estimated amount of $20 billion. Federal Chairman Jerome Powell spoke today, sharing their view that the U.S. is in “a good place” economically. Growth for Q1 is expected to range from 1-2%, largely due to the 35-day partial government shutdown. As it stands, growth for Q2 is expected to exceed Q1 but will likely slow down later in the year due to geopolitical uncertainties, and government spending, among other factors. Although the American economy is gradually slowing, the unemployment rate remains low. A monthly average of 223,000 new jobs became available during 2018, but that number is expected to fall during 2019 since there are less individuals searching for work. The Fed estimates that the unemployment rate will stand around 3.8% by the end of 2020. Inflation rates are estimates to rise from 1.7% to 1.8% by the end of the year, which is significantly lower than the December forecast of 1.9-2%. It is now expected that rates will reach at least 2% by 2020. The Reserve pointed to the reduction in energy prices as a leading cause for the lower rate of inflation. On the currency front, the US Index fell -0.41% this Wednesday (last reading 95.99). The USD/CAD decreased -0.11% (last reading 1.3304). Major Canadian markets slipped into the red today: the TSX Composite closed at 16167.56 (-0.13%), while the TSX 60 closed at 963.27 (-0.26%). Brazil’s Bovespa continued to inch away from the 10,0000 level, falling by -1.55% (98041.37 close). Crude climbed above 60 USD a barrel for the first time since November, and the latest report states that there is a large decrease in U.S. stockpiles. A mixed day for the Energy market: Brent increased 0.81 USD/BBL or 1.20% to 68.29 and crude increased 1.05 USD/BBL or 1.78% to 60.1999; gasoline increased 0.02 USD/GAL or 0.88% to 1.91, and heating oil increased 0.01 USD/GAL or 0.73% to 2. However, natural gas took the opposite route, decreasing 0.04 USD/MMBtu or 1.53% to 2.83. Top commodity gainers were Lean Hogs (4.24%), Coffee (3.53%) and Crude oil (1.78%). The biggest losers were Rubber (-2.10%), Nature Gas (-1.60%), Bitumen (-1.34%), and lumber (-1.31%). Japan -0.04%(+1bp), US 2’s 2.46% (-0bps), US 10’s 2.60%(-2bps), US 30’s 3.03%(+2bps), Bunds 0.10% (+2bp), France 0.48% (+0bp), Italy 2.54% (+6bp), Turkey 15.60% (+12bp), Greece 3.78% (+3bp), Portugal 1.32% (+2bp), Spain 1.19% (+1bp) and UK Gilts 1.18% (-1bp).